Ife zone 1, which comprises of Ife Central, Ife East, Ife South, Ife North and Area Office. Ilesa zone 2, comprises Ilesa West, Ilesa East, Atakumosa West, Atakumosa East, Oriade and Obokun. Ede zone 3, comprises of Ede North, Ede South, Egbedore and Ejigbo. Ikirun zone 4, comprises of Ifelodun, Boripe, Odo-otin, Boluwaduro, Ila and Ifedayo. Iwo zone 5, comprises of Iwo, Olaoluwa, Ayedire, Ayedaade, Irewole and Isokan. Osogbo zone 6, comprises Osogbo, Olorunda, Orolu and Irepodun. 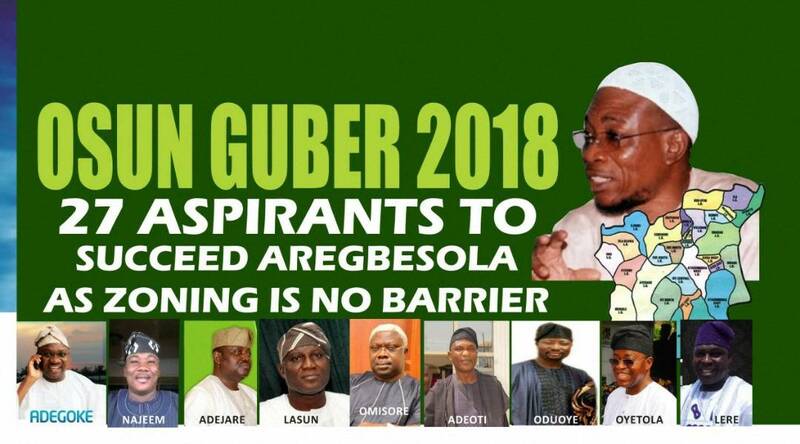 According to another school of thought, Osun State, just like other States across the Federation, has six distinct divisions, meaning that every Senatorial District has two distinct zones that should not be marginalized. The school believes that it would not be proper to share political positions and other benefits basis without taking cognisance of the other legs on which the districts stand. Which breaking down the components of the three Senatorial Districts in the State, some analysts explained that in the East Senatorial District, there are Ife and Ijesa axis while the West consists of Iwo and Ede zone. As for the Central, there are Osogbo and Ila (with their environs) axis. The argument was then shifted backward to explain why some axis are being marginalized in the scheme of gubernatorial benefits since the period of the Western Region. Going down the memory lane by the above two analysis on Osun zoning formula, the first indigenous Governor in the defunct Western Region was Sir. Adesoji Aderemi between 1960 and 1967. He hailed from Ife in the Eastern District of the present Osun State. The late Cicero of Esa-oke, Chief James Ajibola Ige (SAN), who was once the Governor of Oyo State also hailed from Ilesa zone, Eastern part of the present Osun State in 1979-1982. Ede axis produces Alh. Isiaka Adeleke between 1992 and 1993 as governor from the Western part of Osun State. Chief Bisi Akande from the Central Senatorial District of Osun was the governor between 1999 and 2003 from Ila axis. Prince Olagunsoye Oyinlola was the governor in 2003 to 2010 also from Okuku, (Ila zone) of the Central District of Osun while the current governor, Ogbeni Aregbesola, an Ijesa man from the Eastern part of Osun since 2010 to 2018. Now, as we can see, all the three Senatorial Districts have tasted the sweetness of the coveted seat. But when we break it down from one of the two legs of each axis, Osogbo and Iwo zones from Central, and Eastern part of the State has not occupied the office of the governor at least for a day. 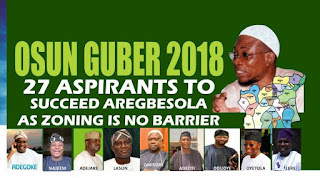 This must have informed the seriousness some aspirants from both Central and West are exhibiting in their activities towards becoming the next governor of the state from next year. From Osogbo axis, some notable and serious contenders for now are: Kunle Rasheed Adegoke (K-Rad), a youthful legal practitioner from Osogbo, Hon. Lasun Yusuf, the Deputy Speaker of the Federal House of Representatives among others. From Iwo axis, notable among the aspirants are the SSG to the State Government, Alh Moshood Adeoti, House of Representative Member, Hon. Amere Gafar, Hon. Babatunde Taiwo Igbaotun, Alh. Fatai Akinbade, Mr.Lere Oyewumi, Elder Peter Babalola, Sen. Olasunkanmi Akinlabi among others. Others from Osun West Senatorial District are: Rt. Hon. Najeem Salam, Bar. Adejare Bello, Prof Mojeed Alabi, Prof Remi Aworemi...While those from Osun Central are: Dr. Ajibola Basiru, Alh Gboyega Oyetola, Bar. Kayode Oduoye, Mr. Felix Ogunwale, Mr. Sunday Akere.